Came across a couple of these today and decided to start a thread with them. If you have any, please post them here. Thanks! I first I thought this stamp had something to do with math. 2 times 5 (fingers) equals 10. Boy was I wrong. The five traditionally recognised human senses of sight, hearing, taste, smell, and touch will be celebrated with this set of innovative stamps. These stamps were designed by Zinc Design Consultants, who created strong, bold images to illustrate each of the five senses in a set of stamps that are both striking and original. 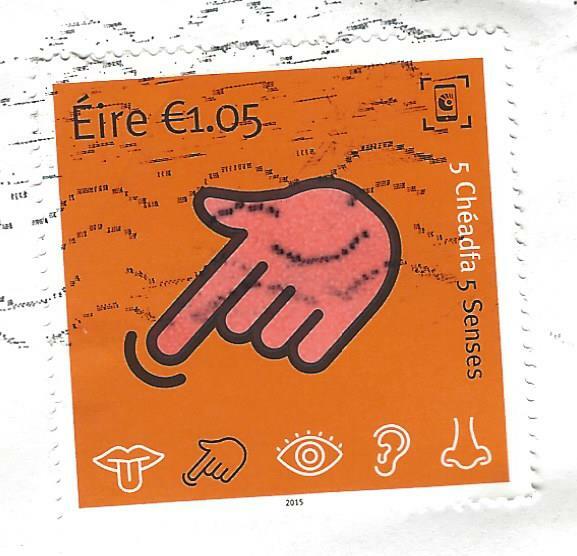 The €1.05 stamp will recognise Touch – where thermochromic ink has been used, so that when the hand illustration is touched, it changes colour. Since the hand was printed with thermochromic ink, it temporarily turned transparent when absorbing some of the light from the high intensity scanner bulb. Pink must be the "underlying" color beneath the orange thermochromic ink. It probably stayed pink (i.e., thermochromic ink stayed transparent) for at least a few seconds after scanning, but you may not have noticed. 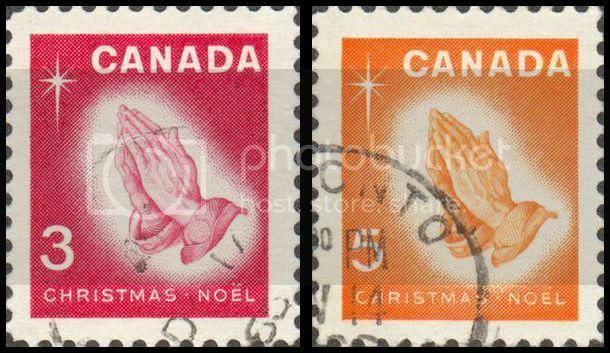 If you want a picture of the stamp in its "normal" color, then use a digital camera. Very interesting and innovative stamps. These are the types of modern stamps that I love!!! Thanks for posting such a great stamp, and thanks to Ireland for producing such a great stamp! This is a great topic and I think we are all going to be surprised how many stamps with just hands on them are out there. Looking forward to contributing....when I actually have time. Here is a picture I took with my phone. Its still comes up a little off colored. As for the underlying color, when I press my thumb on the hand for a few seconds and remove it, the color is white. I agree, very interesting stamps. Commemorates the 175th anniversary of the Bill of Rights (the first ten amendments to the constitution) that established freedom of religion and speech, freedom of the press, the right to a jury trial and other safeguards to human rights. 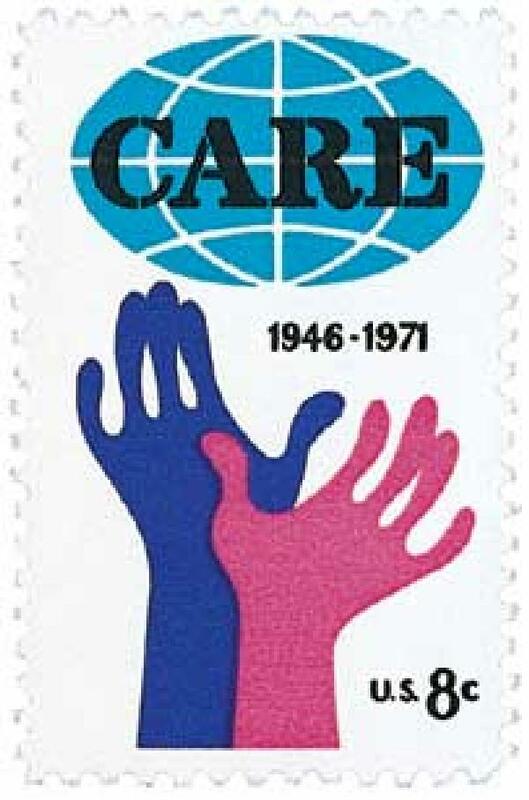 This stamp commemorates the 25th anniversary of CARE (Cooperative for American Relief Everywhere) that delivered its first packages to Europe on May 11, 1946, in the aftermath of World War II. The program was a joint U.S.-Canadian initiative. 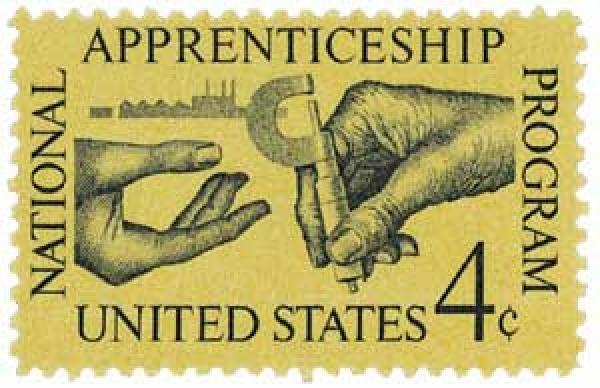 This stamp commemorates the 25th anniversary of the National Apprenticeship Act. Passed in 1937, the Act established standards for apprenticeship programs. It included regulations that protected the health and welfare of its members, and promoted the hiring of apprentices. The stamp shows an older, weathered hand passing a micrometer (measuring tool) to the hand of a younger person, to symbolize the passing of knowledge. The legislation was also called the “Fitzgerald Act,” after Connecticut congressman William J. Fitzgerald, who sponsored the Act. Fitzgerald had worked in a foundry (factory specializing in casting molten metal) as a young man. 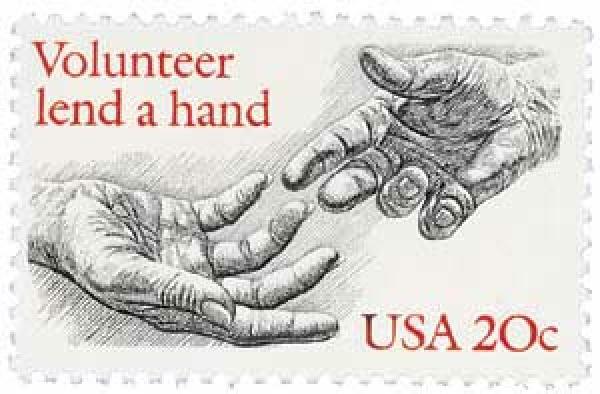 This stamp was issued to pay tribute to the millions of Americans who give of their money, time, and even possessions in order to help their fellow man. Thanks for using the camera! That's interesting. Yes, obviously, there is no underlying ink, just the paper itself. So then, why is it being scanned/digitized a slightly different shade? Looks like it is a spectral difference that is not significant enough for our eyes to pick up directly. But it begs the question, then why does it become more obvious when digitized? Thanks again for taking the camera pic! 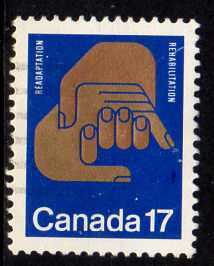 In 1971-4 West Germany issued a very worthy set of stamps with the theme of accident prevention. Here is a hand above a machine with an inadequate-looking finger-guard. From the same 1971-4 West German set on accident prevention, two hands, a ball, and an oncoming car. Hepburn formed 1st miners’ union in 1831. Owen improved working conditions in his mill and established schools. Lord Shaftesbury philanthropist and sponsor of reform work laws. Frey pioneer of women’s prison reforms. 1988 was the centenary of the German Samaritan Workers' Association, a first-aid voluntary organisation, and West Germany issued this stamp in that year. 1990 was the 40th anniversary of the founding of the International Chamber of Commerce. 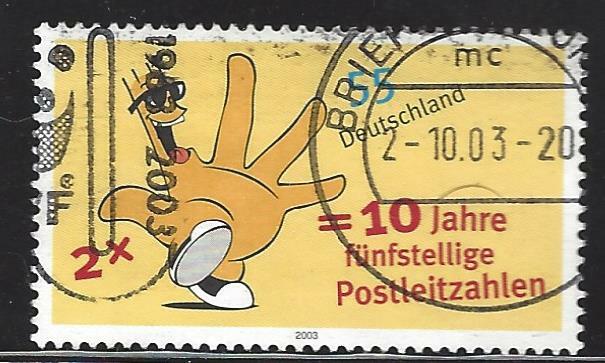 Here is a West German stamp issued to mark the occasion. A hand and quill pen on a 2001 German stamp issued for the 250th anniversary of the birth of Johann Heinrich Voss (1751-1826), who translated Homer's epics into German. a 1945 Carpatho-Ukraine stamp, maybe the first hand stamp?? Not listed in Scott, so probably a Cinderella. 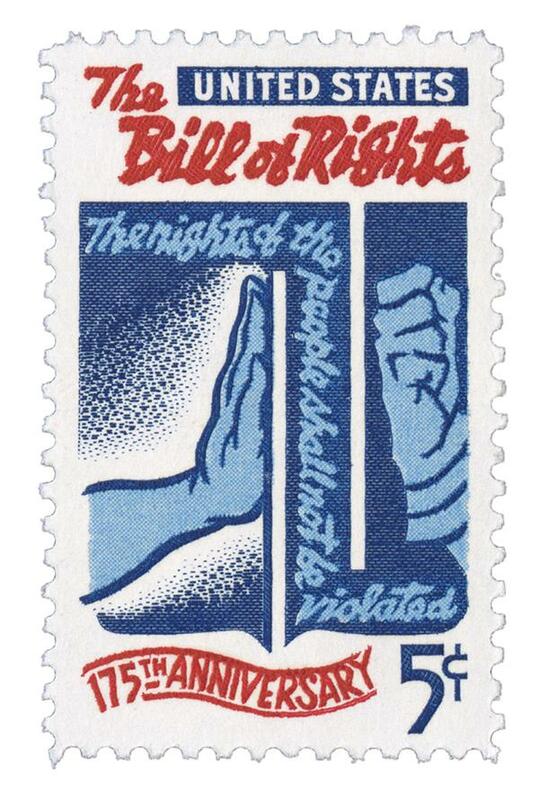 So which stamp has the honor of being the first hand postage stamp?